Die Cast Medallions allow for intricate designs and cut out shapes. Made from zinc, these strong, lightweight medallions are created when molten medal is injected into a steel mold. Designs can be color filled with soft enamel paint, cast in 3-D, or cut out so you can see through the medal. Your choice of bright brass, silver, or copper colored plating available. Sizes range from 1-14" to 4" in diameter; standard thickness is 3mm. 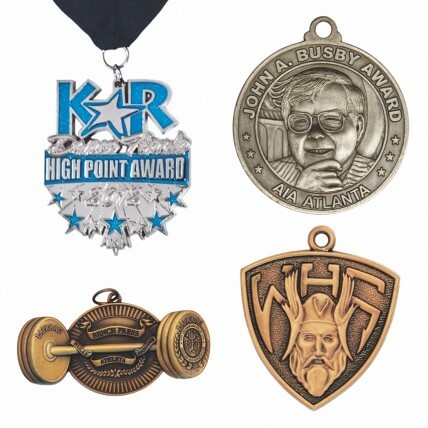 Your design can be on a single side or both sides of the medal (for additional fee). 5 Week Production Time. *NOTE: Custom medallions are special ordered and require a minimum of 100 pieces. Production time for this product is 35 business day(s); expected pickup or shipping date is 06-10-2019.